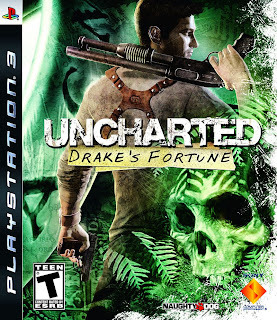 Uncharted: Drake's Fortune is a PS3 exclusive 3rd person shooter/platformer, and something of a phenomena. The game (and it's sequel, Among Theives) was a massive hit both commercially and critically, with the game holding an illustrious metacritic rating of 88, reflective of its extensive horde of raving fanboys who will hear no ill spoke of the game. And I can't figure out what all the fuss was about. I'm forced to assume that most of the game's die-hard fans are a younger audience who don't realise that the game presents essentially the same tired platforming gameplay of the Tomb Raider series and its countless clones, just with a coat of fresh paint. The game isn't without merit, and it's a very solid, very refined package, but it's hard to find anything even remotely special about it. The game's characters are probably on of its strongest points. They're all very cliché, but they're at least all likeable and competently voiced. Like a lot of things in the game, they could've been pulled straight from hundreds of adventure epics, but the execution is quite solid here. The same goes for the game's story – it's very, very derivative (it's pretty much the same big-picture plot as Raiders of the Lost Ark, actually) but is reasonably well executed. Again, ditto with the setting – the game takes place on a remote jungle island featuring the ruins of some kind of ancient civilisation. There's really not that much to say here for this particular title. You could argue that it's supposed to be almost a parody of the adventure genre, and that might make just how derivative it is tolerable, but frankly I just found it very dull and unimaginative. This is a recurring theme throughout all aspects of the game, actually. Everything is very well executed, but it shows an incredible lack of creativity, ambition, or innovation. Maybe that's enough for some gamers. Hell, it's obviously enough for a LOT of gamers, based on the game's fanbase. But it isn't enough for me, and I'm not going to pretend this game is the best thing since sliced bread to cater to the game's fanbase. I'd heard a lot about how stunning the environments were in this game, but I honestly didn't find them that impressive. There were some fairly striking locations, and they were generally well-detailed, but there's an overwhelming sense of blandness hanging over them. 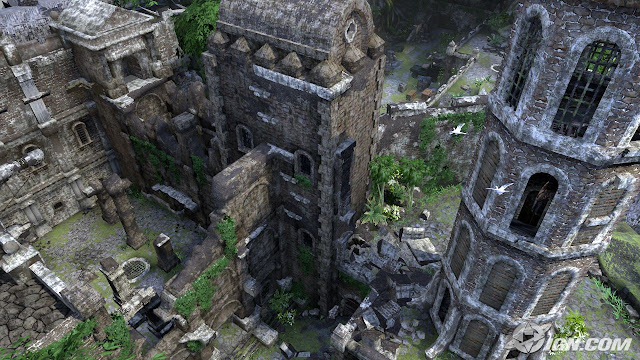 These are the same jungle rivers and the same overgrown ruins I've seen thousands of time. Your game could have the best graphics in the world and these locations still wouldn't do anything for me. The game's environments lack any kind of atmosphere or any really distinctive areas, and the majority of the areas just feel like generic arenas for fighting bad guys, replete with dozens of chest-high walls (because they are). I get it, they're ruins. The graphics themselves are passable from a technical standpoint, but they don't have any particular style or distinctive flair. The game looks fine, but there's nothing particularly impressive about it. I liked small touches, like the creases in character's clothing moving as they did, and the fact that characters get wet when they've been swimming, but really there's nothing that amazing here. At least they didn't go too overboard with the bloom and the entire game isn't brown. Some of the effects look a little odd, like the grenade explosions. It's nitpicking but it bothered me. I didn't much care for the sound design in the game. The weapons and explosions all lacked weight and were mixed too quietly for my tastes. It's possible my perceptions have been warped by my recent Medal of Honor-ing, but the game sounded really bland to me. The music was pretty decent in parts but wasn't anything really different. 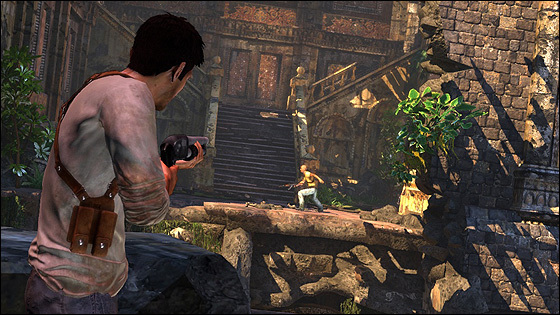 At its core, Uncharted is a combination of cover-shooting and platforming. People have sometimes describe this as an adventure game, but to me that implies that puzzles would be a large part of the game (maybe I have an out of date definition, but there are still games being made that I would consider proper adventure games, for example, Penumbra). There are a few puzzles in Drake's Fortune, but they are so short, easy, and infrequent that I think they're actually barely worth mentioning. You'll come to a room with some objects you can manipulate in it and some kind of obvious impediment to your progress, and then either look for a very obvious environmental clue or open a journal which basically just tells you what to do. The combat in the game is dull. It's so very, very dull. Most of it just feels like filler to me, as well, with only a few battles with any clear reason or any kind of significance. The quantity of enemies you kill just seems absurd given the game's setting, as well. Apparently the main villain hired quite a large personal army of mercenaries to help him find some treasure, when the only opposition he was expecting was MAYBE one guy who isn't even trained in combat. It was a smart move though, because you have no problems killing hundreds upon hundreds of generic goons. The game uses something I like to call “Halo pacing” wherein you basically progress through a series of arenas in which bad guys attack, and you're expected to have to do each major battle several times. I hate Halo pacing. It's lazy, it artificially increases the length of the game, and it's just plain boring playing the same battle several times in order to advance. At least they didn't make the game too easy, I guess, but I really wish I hadn't had to spend so much time fighting bad guys when the games combat is so bland and lacks any kind of feeling of suspense, tension, or excitement. Killing the armies of goons that attack you just feels like a chore. The melee combat is a bit better than the gunplay, but it's extremely simplistic and you'll rarely use it. There are basically two combos you can perform, but you hardly ever get a chance to run up to an enemy to perform them. You just get shot. 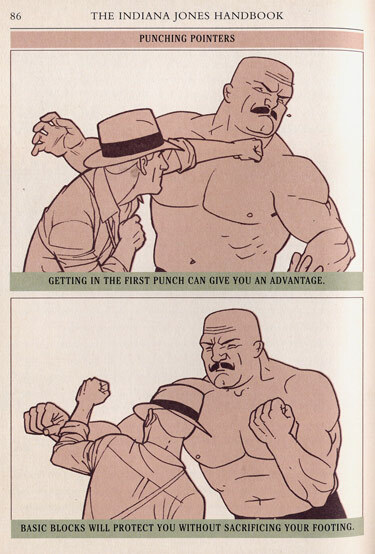 I wish they had made a bit more of the unarmed fighting, as it would really have helped to give the game more of the Indiana Jones/action-adventure feel that it was obviously going for. It's actually so uncommonly used that I had a hard time finding any screenshots of it, so here's something much cooler. The platforming sections – of which there are many – are well-executed at least in the sense that they play smoothly and the camera and controls rarely cause you to die when you really shouldn't have. It'll happen, but not as much as in a lot of 3D platformers. They're also very easy and not particularly interesting. Again, they almost feel like padding. At this point it kind of seems like I'm saying the entire game is padding. Well, there are also a few set-pieces in the game. The game's set-pieces try to capture that exciting action movie feel, but I felt like they were never quite intense enough. There are some vehicle sections, but these are in one case extremely, EXTREMELY generic (shoot a gun on the back of a car at other cars that are chasing you) or just poorly executed (jetski sections where you have to stop moving to shoot even though the person shooting isn't the driver – these would've worked better with the AI doing the shooting in my opinion) so all they really achieve is mixing up the gameplay a little bit to stop it from getting TOO same-y. There are few bits of the game outside of these that don't just feel like filler to me. 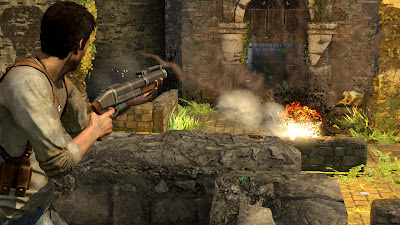 At least the game is long enough – 10-12 hours, I would estimate – but it could easily have been a stronger game if it had been condensed down to 6-8 hours that cracked along at a good pace, instead of forcing you to undertake countless gunfights that are tedious instead of challenging and only serve to discredit the plot and setting. Uncharted is ultimately competent but dull. It's Tomb Raider for the current generation, and it really doesn't bring anything new or innovative to the table. It's obvious that they tried to give the game the feel of a classic action-adventure film, but repetitive combat and derivative set-pieces means that it falls flat on it's face. It's not a bad rental if you want to kill a weekend, but I can't give it any stronger a recommendation than that. I guess if you missed out on 3D platforming's prime in the late 90s and early 2000s, this might feel novel, but for the grizzled veteran gamer there's really nothing substantial to commend this game. I'll probably give the sequel a spin in a few days, as I understand it refined the gameplay significantly and made some pretty major strides in other areas. I'll do a full review if my opinion of it is significantly different to this game, or a short look at the differences if not. Either way, you should hear from me on that count before too long. Interesting review! However what you call derivative I would call a respectful recreation of the 90's/ early 00's adventure genre with a focus on story and character development. It was an early (2007) ps3 title so it lacks the visual lustre of more recent titles (and its sequel). As a new IP just finding its feet, i believe it is a very solid effort. The combat was nothing special but personally i believe the setting and platforming sections were really breathtaking at times. I would argue it wasn't trying to be groundbreaking or particularly challenging - It was a successful homage (with a little tongue and cheek) to a relatively forgotten genre in this console generation. As the first release it was establishing attachments to the world and key characters - in an accessible and approachable way. It wasn't perfect but it was a solid base for the sequel to build upon. And to add to previous comment i couldn't disagree more about the sound design - particularly the games soundtrack. Greg Edmonson (Firefly composer) does an outstanding job with an amazing score that really enhances and develops game's atmosphere, and is implemented perfectly throughout the narrative/ gameplay to add depth to the player's experience. I guess the biggest thing with the music was that I mostly just didn't notice it. That's not necessarily a bad thing, but it does mean that I'm not really left with a strong impression of it. As for the rest... Yeah, it's absolutely a reasonably solid title in the genre, I guess I just expected a little bit more from a game that's been so successful. It didn't have to be revolutionary, but I felt like it didn't really do ANYTHING to make it stand out. 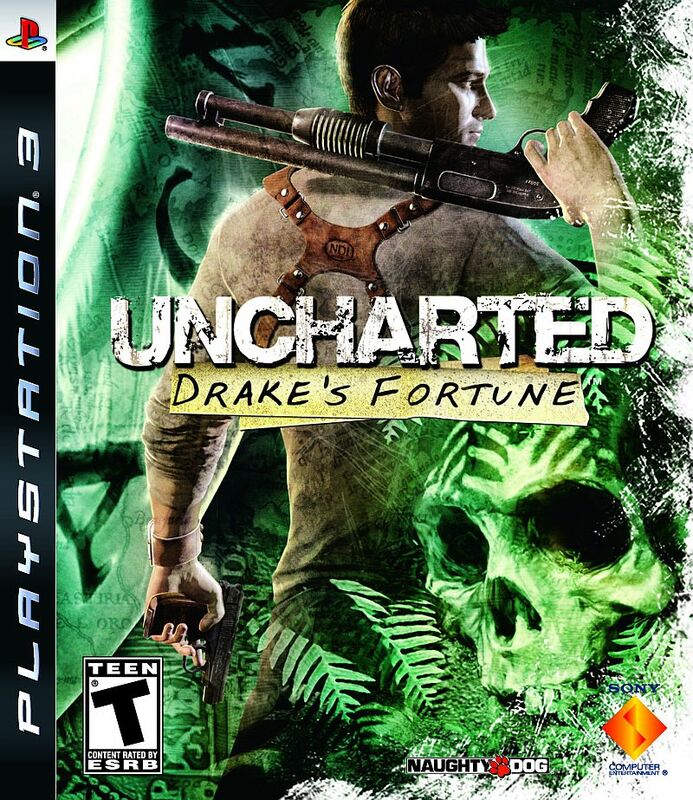 It's true that I didn't take its release date into account, and honestly, the combat that I find so boring and derivative now would probably have felt a lot fresher to me in 2007, before every game and its dog became what I refer to as a "cover-shooter". You say that it has a focus on story and character development. I wish I could agree, because I felt like those were the best parts of the game, but to me the game felt way too shooting-heavy for the style of game it was. I wish they had spent a little more time on actual puzzles as well as adding at least a bit more dialogue - I found the characters really likable, even though they were pretty archetypal, and would've loved to hear more from them. Anyway, I'll rent the sequel in a few days (probably - depends on if I get MoH multi-player working and when MGS4 arrives) and maybe I'll like that one a little more. It wasn't that the game was suffering to play through, or I wouldn't bother checking out the sequel. My expectations were just a bit higher because of all the critical acclaim, and I was a little disappointed. I really hope you do find the time for the sequel... The first was critically divisive, and i can certainly see where you are coming from - but the sequel received essentially universal praise.